If you have read some of my previous, then you know this month is my birthday! I'm excited and blessed at the same time, because Christmas is a week and two days after my birthday. You will probably hear me say this quite often, so I apologize in advance. I can't believe I'm turning 25 years old, I remember when I turned 21. I actually cried that day, you would've though I was going through a "midlife crisis". The reason I cried was because I didn't want to be considered an adult. I just wasn't ready for that responsibility. I was scared and I wanted to be a kid all over again. It was so much easier and I really didn't have to worry about anything. 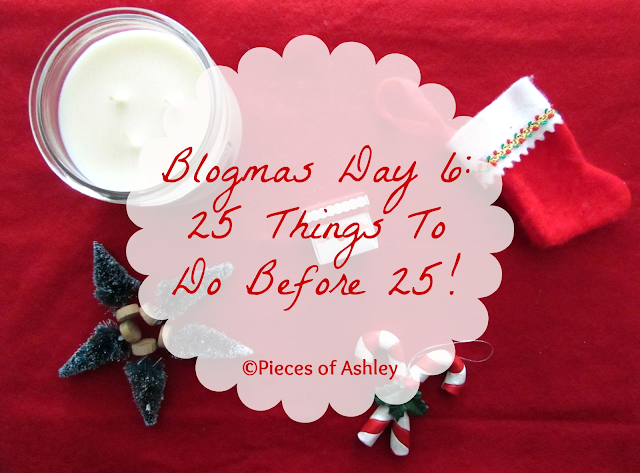 So during the last week and a half, I have left of being 24 I decided to do 25 things before 25! You're probably thinking she doesn't have enough time and you would be right, if I was planning on doing something outrageous. Have you ever heard of "it's the little things that count"? Well the 25 things I'm doing before my birthday is simple and small. But most importantly they mean so much more. These things are in no specific order. Just so you'll know! Some of these things should be done everyday, but since it's almost Christmas I'm going to spread the love around even more! 24 Learn How To Put On Eye Shadow Correctly (ha ha ha)! 25 Get Another Ear Piercing (Maybe two)! I hope you enjoyed reading and let's see if I actually complete these things in time!